It’s a dreary, gray day and I can’t seem to make myself do the things I should be doing. Often, writing a blog post helps me to get started. Today, though, I’ve been staring at this blank, text-less space for longer than I care to admit. There’s a dumpster outside one of the houses I can see from my study window—I’ve been watching it fill with heaps of who-knows-what, dragged out from what appears to be a rather unassuming little house. Apparently, though, it manages to contain quite a mess. It may just not be a writing day. 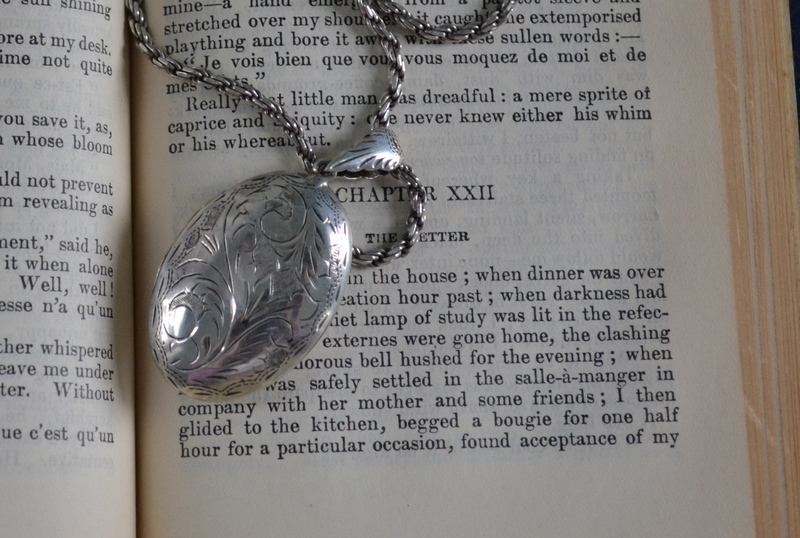 It may be a taking-pictures-of-lockets kind of day. But really, for me, that’s just about every day. I chose the book for my backdrop quite carefully. It’s a favorite of mine—and not just because it has beautiful, deep purple covers. It’s a book I’ve actually read—which, among the piles of pretty old volumes in my house, is rather unusual. I don’t really have any intention of ever cracking the pages of Susan Clegg and her Friend Mrs. Lathrop. Unless, of course, I need to take a picture of a locket. And, just like that, I’ve written something. Maybe there is hope for this gloomy day after all.